I posted a creation of mine on the facebook page last night. It was fab-u-lous! 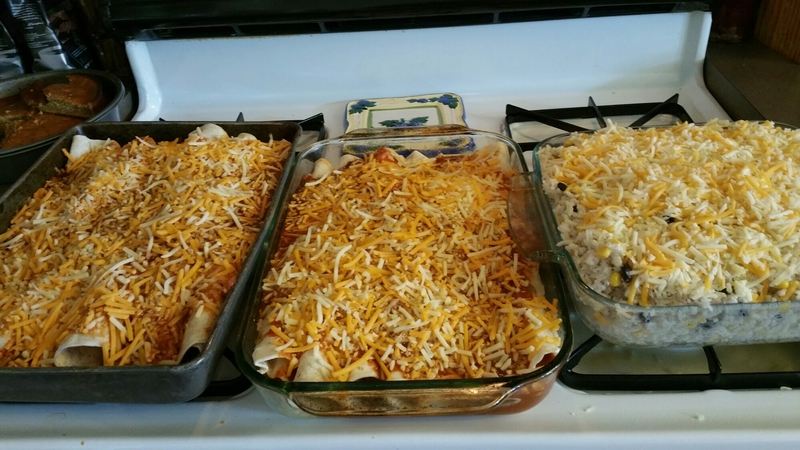 My kids love enchiladas, as do I, but the thing is I like my mexican food spicy. For the longest, I made two pans. One mild, one hot. It can be tiresome, and a lot to prep and clean. Why I didn’t think of this recipe earlier on! Heat oven to 350 degrees. Grease two casserole pans. In a pot, combine chicken and beef, peppers, olive oil, salt and pepper. Cook until pink of chicken and beef or gone. You will need to drain excess water as you cook. Maybe 2 or three times. Once cooked, divide Sauce, brown sugar, and salsa. Mix one half in bowl, and put to the side. Other half, add it to the pot, with meat, along with chopped onions, sour cream, jalepenos. Mix, and let simmer for 20-30 minutes. After 30 minutes, turn off, and let cool. After the filling has cooled, spoon onto tortillas, and roll up to close. Place long way into pans. Take the remaining sauce and top enchiladas. Top enchiladas with on bag of cheese per pan. Bake for 30-45 minutes or until browned on top. Serve with a scoop of sour cream. 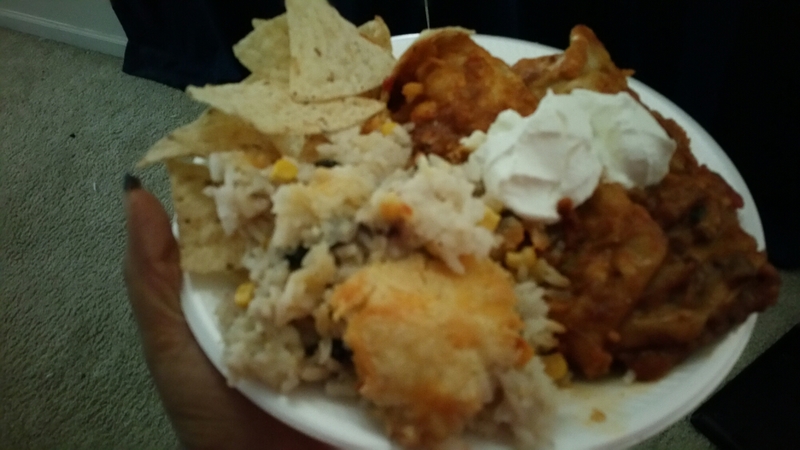 I then made a side dish of rice the kids loved with black beans. Anyway I can get them to eat different things with them going “ew”. Make rice as directed with broth or boil water with cubes first. Turn off water, and add rice. Make as directed. Heat oven at 350 degrees. Grease casserole pan. Mix rice with remaining ingredients in a bowl. Pour into the pan. Cover with cheese. Bake for an hour. Serve with chopped green onion. I paired those up with tortilla chips and citrus pineapple salsa, and homemade peach green tea. It puts you out maybe an hour, hour and half, but well worth it. You can short cut some things…. -reuse leftover chicken or beef strips. You could cook the peppers, jalepenos, and onions with olive oil, then add the meat and sauce. Cuts 30 minutes. Play withthose options if you have time issues, but comes out the same way. I hope you guys enjoy these, and let me know what you think!